The registration documents for the Venezuelan plane, which landed with six nationals of the Spanish-speaking South American nation, have been confirmed as authentic, authorities said Friday. Director-General of the Guyana Civil Aviation Authority (GCAA), Retired Lt.Col. Egbert Field told Demerara Waves Online News that the documents exchanged with the Venezuelan Civil Aviation Authority proved that information provided by the pilots are authentic. 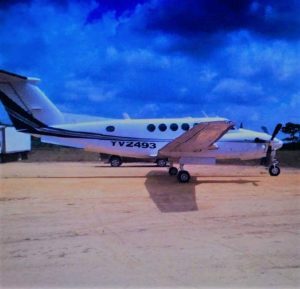 The Civil Aviation Chief said Venezuela confirmed that Beechcraft, bearing registration number YV-2493, is registered to Aerocaribbean Corp. The serial number is BL 23. Online sources show a plane, bearing the same registration markings, being the property of the Venezuelan military, but Field could not say whether it was the same plane. Field said the plane was still in Guyana. The authentication process, he said, included information obtained from the data plate that was located in another section of the aircraft instead of where it is usually located. Previously, police had said the plane did not have a data plate. Head of the Guyana Police Force’s Criminal Investigations Department, Assistant Commissioner, Paul Williams said legal advice would sought Friday. The plane landed at the Cheddi Jagan International Airport on Monday at 3:20 PM with two Venezuelan pilots and four other Venezuelans including two lawyers. Police were told that they were greeted by captain Michael Brassington at the airport and they were here on a business trip.